Summary for the Busy Executive: Splendid. Sensitively played. Close to fifty years after his death, Schoenberg still makes many listeners go "eewwwww." They look at his name on the rare concert program as a child looks at brussels sprouts on the dinner plate – with at least a sense of affront and perhaps a little despair. For many, Schoenberg is the Man Who Ruined Music, even though most haven't heard his output or, if they have, get little coherence from what they've encountered. It becomes "intellectual" music (in a bad sense). To be sure, most of Schoenberg's fans and acolytes haven't helped. Schoenberg's own writings contain much off-putting stuff. The fight over Schoenberg has become, on both sides, largely a religious, rather than aesthetic war – a fight over a style rather than over a body of work. During its course, several dubious propositions have arisen on both sides. Schoenberg formulated a system – known variously as "serialism," "dodecaphony," "twelve-tone," and "atonal" – for which much has been claimed, on both sides of the battle line. However, the terms don't come all that close to describing the music. "Atonal" describes music not written according to Schoenberg's basic rules, and there are tonal serial pieces, arguably dating back to the Renaissance. Furthermore, many composers before and after Schoenberg wrote themes which used all twelve notes of the chromatic scale, usually in a tonal context and certainly not adopting Schoenberg's procedures. However, since Schoenberg referred to his discovery as the "method of composing with twelve tones," I will use the term "dodecaphony" or "twelve-tone" to refer to it. Depending on whom you talk to, it's either the greatest thing since shampoo and conditioner in one or single-handedly responsible for the estrangement of composer and audience. As far as I'm concerned, it's neither. A technique in itself is aesthetically neutral. Mozart and Salieri used the same techniques. We have to talk about individual works. A particular style guarantees neither treasure nor trash. The very term "art" implies how well something is done. The odds run against any composer – twelve-tone or not – turning out a Certifiable Masterpiece. Schoenberg himself said, "Of course, a soul you have to have." If it were easy, anyone could do it. Moreover, much of the current audience is estranged from all sorts of composers. I've seen concert-goers walk out on Nielsen, early Stravinsky, Mahler, Vaughan Williams, Bernstein, Shostakovich, and Beethoven. I've seen concert-goers walk out in droves before the music was even played, simply because they didn't recognize the name on the program. I doubt that dodecaphony alone or even mostly has much to do with this. This sad state of affairs seems far more complex. As I've said, dodecaphony is one more technique in a composer's toolkit. It doesn't make, as some Schoenbergians have claimed, everything else obsolete. A power router doesn't always supplant a dovetail plane. Furthermore, the influence of the system has been overstated by adherents and foes alike. If twelve-tonalists really had the power they claimed, they'd get more recordings and performances. A brief check of CD releases and concert programs in any given year should disabuse anybody of this notion. Commissions of new work – usually a sign of prestige – show a real variety of style. The Argo compilation Dance Mix (Argo 444454-2) lists not one twelve-tone composer amid the current prestigious smorgasbord. It has turned out that the "tonal-atonal" fight was irrelevant to the way music actually moved, just like the "Brahms-Wagner" knockdown extravaganza of the Nineteenth Century. In each case, composers went their own way. We have now neither the tonal Earthly Paradise nor the atonal Olympus, but a wide array of musical styles, only one of which is dodecaphonic. I would also point out that Schoenberg wrote, throughout his career, in different idioms, even after he formulated his system. Listen to the Concerto for String Quartet, the Cello Concerto, the Suite in C for Strings, the Weihnachtsmusik 1921, the 3 Folksongs, as well as to the early, super-Mahlerian Gurrelieder. I hate having to bring this sort of thing up – something I feel the need to do with no other composer – but Schoenberg really has become the musical Antichrist whom well-meaning people believe has fundamentally changed Western European music. In other words, he has become a figure rather than a composer, rather like Beethoven throughout much of the Nineteenth Century. In fact, one thing has popped up pretty consistently in my experience with Schoenberg. If you meet up with those who want to talk about the system (for and against), rather than pieces of music Schoenberg actually wrote, you can pretty much tune them out. They've already missed the point. Does the purposeful lack of key center mean that one hears the music differently? Yes and no. One isn't aware of themes as such (unless you've really studied or you listen better than I do). Intervals and gestures tend to be emphasized, rather than themes. I suspect that most people are bothered by this less than they are by the lack often of definite phrases – in other words, the Wagnerian unending flow of one phrase into the next. I know even very few professionals, after all, who can tell a dodecaphonic score from a highly chromatic one simply by listening. But this applies only to certain pieces, and it's truer of Schoenberg's earlier practice than of his later. In fact, it's the main reason why I dislike his most popular work, the moony, overwrought Verklärte Nacht. In my experience, people most want to know where they are in a piece or at least to watch for and confirm signposts. What most listeners really need, I believe, is a listener's guide to Schoenberg, a roadmap of the larger sections and the occasional side trip to the exceptional scenic view – a guide in which the word "atonal" or "serial" is never mentioned and in which the music is discussed as one talks about, say, Dvořák's "New World." For years, I almost never listened to Schoenberg, at least as a kid, because people kept telling me how awful he was and because I have yet to like Verklärte Nacht, the piece they said they at least tolerated. I never actually had to listen, since he was never on concert programs I attended and most of his music went unrecorded. The lush choral masterpiece Friede auf Erden was the exception. This all changed my freshman year of college. By chance, I walked in on two pianist friends of mine practicing for concerto competitions (one of them took the orchestra's music). I sat in the back of the hall and listened to something that excited me – I remember the sharp, nervous rhythms and the odd harmonic world. What was it, I asked after they had finished. You've probably guessed that it was the Schoenberg piano concerto. I learned two lessons: always listen for yourself and pay no attention to the signature at the bottom of the score. I rushed out to get the only available recording at the time: Glenn Gould with an L.A. pickup group conducted by Robert Craft. What a disappointment! Compared to what my friends had played, this was stodgy, muddy – an aural swamp. Gould was fine, but I've never considered Craft – despite his love for and advocacy of the music – all that convincing a Schoenberg interpreter (or Webern or Berg interpreter, for that matter). It rudely introduced me to an important hindrance to Schoenberg's reception – lack of good performances. Even professionals seldom knew what to make of the music, and Schoenberg often complained (privately; he was pathetically grateful for any performance) of the lack of musical comprehension among many of his interpreters, including big names like Stokowski. Still, I felt it important to record the work in any performance, since it may have convinced other conductors and pianists to take it up. Vaughan Williams said that it took a thousand composers to make a good one. Unless luck rides with you, you can say the same for performances. There really is no Schoenberg performance tradition as extensive as the ones for Beethoven, Brahms, and, recently, Mahler. But the years have passed and have brought outstanding recordings, including those by Rosbaud, Boulez, Mehta (oddly enough), Huber, and Michael Gielen. The two chamber symphonies appear decades apart, the first in 1906 during Schoenberg's period of post-Wagnerian tonal chromaticism. The opening movement to the second chamber symphony comes from the same period, although it was not completed until 1939. Schoenberg often had problems finishing pieces. Sometimes he simply lost interest. Other times he couldn't see his way to his typically ambitious goals. Still other times he had waited so long that he felt he could no longer reconcile his younger and current compositional self. Schoenberg, with characteristic idealism, began the Chamber Symphony #1 to write a popular hit full of tunes everyone could hum. It didn't work out quite that way. About as many people hum this symphony as hum the second movement of Mahler's eighth. The Schoenberg work strikes me as a "concerto for orchestra," long before Bartók's, especially since it so often features solo instruments against the ensemble mass. The orchestration – particularly considering the number of contrapuntal lines – sounds out lean and clear almost to the point of transparency. The ideas, if not exactly hummable, are incisive, vigorous, and memorable. Schoenberg gives you a lot of them as well, and they tumble in one after the other, fast and furious. Schoenberg cast the work in one long movement, but like many one-movement symphonies, it subdivides into four large sections: allegro moderato, scherzo and trio, adagio, and recap. After the briefest of introductions – brief but beautiful – the allegro moderato alternates between a Straussian athletic striving and tender, song-like reflection. The scherzo's a contrapuntal showpiece, a real test of players' ensemble "chops." It demands of each player that he knows when to come to the center (often for just a couple of seconds) and when to get out of the way. The scherzo gives way – in a lovely transitional passage based on superimposed fourths – to a marvelous slow "movement," which meditates in a mood of calm and maturity. In mood, it reminds me of parts of Wagner's Siegfried-Idyl. The recap takes us through a radically foreshortened trip of the symphony - like looking at where you've been through the wrong end of the telescope – so far and ends with the bustling vigor of the opening. Gielen makes all things clear, including the larger architecture of the work. I would have wanted slightly more indulgence and singing in the quieter passages, but that's a quibble. The impulse Gielen and his players give to the movement more than makes up for this. The movement seems to go by in four huge spans. The second chamber symphony, in two movements (Adagio and Con fuoco), opens somewhat like Brahms' second serenade. The work as a whole strikes me as less self-consciously innovative, as if Schoenberg feels he has nothing at this point to prove to anyone, beyond the beauty of the work itself. It's more comfortable with its Nineteenth-Century roots. The extensive opposition of solo instruments against mass, seen in the first chamber symphony, gives way to more ensemble work. The sound is mellower here, less bright and aggressive. Schoenberg has over thirty years of experience as a composer behind him. The whole movement sings a purely Romantic song, filled with yearning. I hear Bruckner in the background – not the religious Bruckner, but the poet of resignation. The con fuoco movement follows with a light-hearted dance, gracious and gemütlich, for the most part, giving the lie to the picture of Schoenberg as dour ascetic. Little storms burst and clear, but I find large good humor uppermost in the movement. A recap of sorts occurs toward the end, when the regrets of the adagio return. Given the previous high spirits, the regrets no longer seem so distant. Schoenberg achieves a completely convincing turnaround in mood. The humor gives way to a painful great sadness, and the symphony ends with this. It immediately put me in mind of 1938-39, the Anschluss and the invasion of Poland. This is music that expresses the devastation of one's home. Gielen is faultless. This is the finest recording of this symphony I know, and I haven't the imagination to conceive of a better. The Piano Concerto comes from the Forties, during Schoenberg's years in southern California, as one of the most remarkable members of a remarkable circle of European exiles, who included Stravinsky, Piatigorsky, Toch, Thomas Mann, Kurt Weill (briefly), Brecht, Eisler, and Werfel. Schoenberg had attracted a few private composition pupils, including pianist, wit, and show-biz personality Oscar Levant. Even so, the Schoenbergs struggled to make ends meet. Levant resolved to do a good deed and commissioned for $1000 a small piece he could play in his recitals. Schoenberg agreed and became excited. His secretary informed Levant that the little piece was becoming a piano concerto (with the name OSCAR, woven into the basic material). For so many thousands more, Levant could receive immortality. Levant panicked. It was much more money than he felt he could part with, and he dropped out. Luckily, another patron was found, and the work received its public première in 1942 with the pianist Eduard Steuermann and Stokowski conducting. Levant, interestingly, later paid Schoenberg the original amount for the piece he never received. 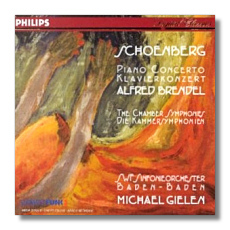 This is Brendel's second recording of the piano concerto (on the first, Gielen also conducted). I've not heard the first. In a wonderfully-written essay, Brendel comments "Rerecording the work… felt like an act of re-generation – as though I were contributing some continuity and progress to a world which, relapsing into nationalism, fascism and madness, appears to have lost interest in both." Brendel also talks about how much more "modern" and less "Brahmsian" the work seems now. Apparently, that was the view most people had in the Forties, even so sophisticated and perceptive a critic as Virgil Thomson. This might have been the effect Gould and Craft aimed for. However, if you examine any late Schoenberg score, the markings indicating which voice should sound through the texture at a particular moment are meticulously inserted. If you hear a "wash of sound," you're probably not hearing Schoenberg's intentions. The concerto is in four movements, played without pause. Brendel and Gielen, despite the rhythmic urgency of the music, always keep the texture lean and light. It is the rhythm and "character" of each movement that shine through above all: in the first movement, a graceful, yet nervous waltz; in the second, a dark, almost Bartókian scherzo. The third movement, which takes the concerto's emotional weight, strikes me as unusual in Schoenberg's output – the least dependent on 19th-century melodic practice. Schoenberg sings a lament, alternately lyrical and angular. According to Brendel's liner notes, Schoenberg had sketched the movement with the annotation "A difficult situation was created" – all annotations, incidentally, suppressed in the final score. It's difficult to hear this music and not think of the agonies of wartime Europe. Brendel himself gets reminded of Picasso's Guernica. The piano takes extended solos, bearing the expressive burden. Brendel plays magnificently. With him, the movement has become not 12-tone music, but music. It challenges the listener's emotions, far more than the intellect. The rondo finale is marked "giocoso" (joyfully), but it doesn't fall out that way. The music moves rapidly and, for the most part, lightly, but the gloom of the previous adagio persists. The rondo subject tries to keep things light, but the episodes seem mostly grim. However, about a minute near the end, Schoenberg appends a "stretto," in which the various voices seem to interrupt each other with statements of the theme – a new statement before the old ones finish. The effect is comically grotesque – as if a litter of imps were swept out over the doorstep by a brisk, sturdy broom. If the music doesn't achieve Beethoven's joy, it's not mired in Wagnerian gloom either. One does what one can. If your curiosity ever impels you to sample the "difficult" Schoenberg, try this disc. As I say, it treats Schoenberg's music as music, rather than as some weird sort of tract. Gielen and Brendel have rendered to this composer a tremendous service.